One of the limiting factors of the hybrid application approach is the reliance on a mostly community driven plugin ecosystem to access native functionality with Cordova. Most of the time you can easily find a Cordova plugin that provides the functionality you want. However, sometimes for more niche requirements you may struggle to find an existing plugin that does what you need, or perhaps you can find one but it is no longer maintained. If you don’t know how to take matters into your own hands and implement the native functionality yourself, you will hit a brick wall and you will either need to change the requirements of your application or give up. 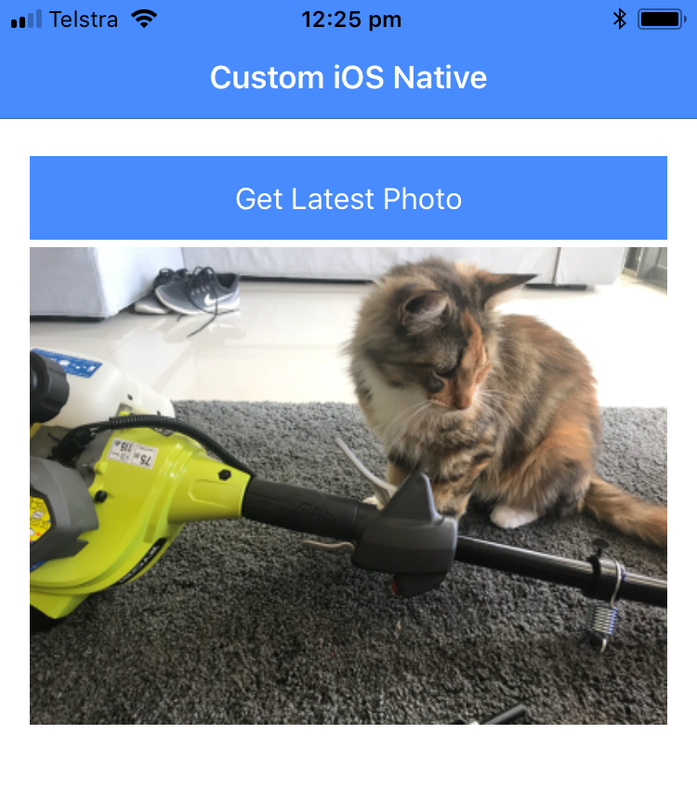 Capacitor is aiming to make the process of integrating native code into your Ionic projects (or whatever you are using Capacitor with) a little more approachable. You will still need to write native code for the platform you are targeting (as you could with Cordova), but the process of creating a plugin to expose native functionality to your web-based application is quite straight-forward with Capacitor. NOTE: I have no idea if there is a plugin that exists already that does this, but let’s pretend there isn’t. The point of this exercise is to see how difficult it is for us to run our own native code when none of the existing plugins satisfy our needs. Not having to write native code is not the only benefit of using a hybrid approach. I would argue the main benefit is being able to create an application with a single codebase that runs anywhere the web does. You would rarely ever need to write native code because most of the time there will be existing plugins to do what you need. In the case that there isn’t, though, a little bit of native code can remove a roadblock from your project. I have very little experience with native iOS/Android development. I have worked a little bit with Java and have developed some native Android applications a while ago, but I have next to no experience with Objective-C/Swift. I think it is then interesting to see how difficult it would be for someone like me, whose experience is mostly with web tech, to successfully integrate some custom native functionality with a bit of Googling. I would like to preface this tutorial by saying that I don’t think it is a good idea to rely on cobbling together solutions you don’t understand from StackOverflow to build your application – this is an almost guaranteed way to build a buggy and unmaintainable application. However, as I mentioned, most of the time you won’t need to do this. If you just need to add 50 lines of Swift or Java that you don’t completely understand to your project to get past a roadblock and back into web land, then I don’t really think it’s a big deal. NOTE: In order to complete this tutorial, you will need macOS and XCode. This tutorial assumes at least a basic level of knowledge of Ionic. Although you do not need to have a solid understanding of Capacitor, it will be helpful to at least understand what the role of Capacitor is. If prompted, don’t integrate Cordova with the application (we will be using Capacitor, of course!). Since Capacitor is currently in alpha, I don’t want to add the exact installation instructions here as they will likely change. Before continuing, make sure to follow the installation steps in the documentation to integrate Capacitor with your project. You should also make sure that you have installed at least the LTS version of Node (currently version 8.9.4). Capacitor will not work with some older versions of Node. An easy way to manage Node versions on your system is to use this package – n will allow you to easily switch between Node versions. Since we are working with iOS, you should make sure that you have all of the required dependencies (make sure to install CocoaPods). What Does a Plugin Look Like? You will find that each of the plugins has a .swift file that defines the plugins functionality, and then there is a DefaultPlugins.m file that registers all of the default plugins. Open the Camera.swift file and take a look around. It is worth noting that if you just need to run some native code and there is no need to expose the result to your application running in the web view, then there is no need to create a plugin. You can just add the native code directly to your project. Now that we have a basic idea of how a Capacitor plugin works, let’s add our own. All we are going to do is add a new plugin directly to our local project. The Capacitor CLI actually provides a way to easily generate standalone plugins that you can publish to npm and install just like any normal plugin. However, this tutorial is just going to focus on manually adding code to the local project, and I will likely cover creating the plugin “properly” in another tutorial. Since Capacitor is so new, I’m not sure that where I have placed these files, or the way I have designed them, is necessarily “best practice” for Capacitor projects – if anybody in the know is around, feel free to chime in! 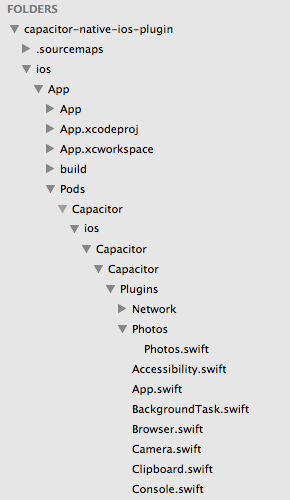 In order to add our plugin, we will be adding a new .swift file to the same folder as the rest of the Capacitor plugins. We will also need to add a new .m file to register the plugin. Before we can start building that plugin, we need to figure out how we can get the latest photo from the user’s library using Swift. The end result of these functions is that it produces a base64 string that contains the image data of the latest photo in the user’s photo library. Now that we have the code to do the job, we just need to work that into a Capacitor plugin. All we’ve done here is add the parts necessary for Capacitor to recognise this as a plugin, and expose the function/result to our web view. Eventually, we will be able to access this function through our application using PluginTest.getLastPhotoTaken() and it will return us the base64 encoded image. Now we just need to create the .m file to register the plugin. The documentation notes that you should create this file using the New File... interface in XCode. Make sure to do that. Our plugin should be all ready to go now! Now we just need to add some code to our Ionic application to make use of it. To avoid TypeScript errors, it is important to extend the PluginRegistry interface with your new plugin. For convenience, I have just added that directly to the home page, but I would be interested in hearing where a more appropriate place for these definitions would be. We have created a getLatestPhoto function that we will call from our template, and inside of that we just use our new PluginTest plugin like we would any other Capacitor plugin. We assign the result of this to this.lastPhoto which we will use to display the image in our template (which is why we have included the DomSanitizer – by default you can’t display base64 images like this). NOTE: There is a slight delay in fetching and returning the photo. For the sake of UI/UX we should displace some kind of placeholder or loading indicator whilst the photo is being fetched, but that’s a bit out of scope for this tutorial. and run the application using XCode. You should then be able to tap the “Get Latest Photo” button and see the last photo that was taken on your device – if it’s not too embarrassing, feel free to share it in the comments! This was quite a fun exercise, and it adds a lot of confidence knowing that, if you need to, you have the tools available to run your own custom native code. The more comfortable you are with Swift or Java the better, but I don’t think it is unreasonable to develop basic plugins like this even if you have little to no knowledge of the native code. UPDATE: A tutorial on building this plugin as an installable npm package is available now.